Styling hair with beauty tools can certainly result in striking looks that will heighten your appearance and attitude, however, manipulating the hair with heat and chemical treatments will also degrade the hair shafts over time. People who regularly bleach their hair are especially prone to suffering damage and dryness, and finding ways to combat the brittle frizz can be so frustrating that cutting it all off may seem like the only solution. Products like L'Oreal EverCreme Deep Nourishing Masque claim to alter your hair's current state for the better, while promoting the overall health of your hair. L'Oreal is known for selling a vast array of hair care and cosmetic products, and this particular formula is meant to act as a hydrating treatment that will reestablish moisture into the hair while protecting it from further damage. Does L'Oreal EverCreme Deep Nourishing Masque Work to Treat Damaged Hair? While it may be useful in providing sort-term hydration, it likely will not repair the hair from a fundamental level. It will act as any typical hair conditioner by lubricating the hair and smoothing out the roughness of the hair shaft. However, your hair will still remain technically damaged. If you intend on using high heat and chemical-based treatments on your hair, L'Oreal EverCreme will do little to protect it from further damage. However, if you're looking to hide the current fallout your hair has undergone, this product may be of benefit to you, but you shouldn't expect it to directly treat damaged hair. As the name implies, it can only achieve a mask of the problem. One of the perks of L'Oreal EverCreme, is that it doesn't feature a barrage of harsh chemicals and irritants that could cause an allergic reaction. The brand also proudly admonishes that this product is completely vegan. Since some cosmetic companies still test their products and ingredients on animals, this is certainly an advantage for anyone who's conscientious of animal rights. However, when put in motion, the product seems to fall short of some of the promised results. L'Oreal EverCreme Deep Nourishing Masque claims to be fortified with omega-3 fatty acids that will leave hair feeling silky and refreshed. While it's true that the presence of lipids can make the hair shaft appear more smooth, it won't penetrate the hair and provide comprehensive care. In order to reap the benefits of fatty acids, one must regularly ingest them as part of a nutritious diet. While there are many customers who had satisfactory results with this product, there are others who complained of their hair becoming overly greasy and even itchy in some cases. If your hair is prone to oiliness and has a tendency to feel weighed down, this product may be too unctuous and irritable. 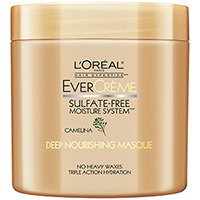 As with many products made by the L'Oreal brand, EverCreme Deep Nourishing Masque can be found in most drug stores, department stores or supermarket chains. if you have trouble finding it in your area, you can also easily purchase it online from a variety of merchants. If you have any additional questions or concerns about this product or similar treatments for damaged hair, check out more product reviews here.